If you've been following my Redemption story (Part 1 & Part 2) you'll know that I've been long awaiting a very special card. One that would pick up some fairly nice returns in a trade and possibly some good cash on eBay. Those two reasons were the only things pushing my desire to get my hands on this card. I would only really want to hold onto this card because of it's rarity, but I think it would be appreciated more somewhere else. 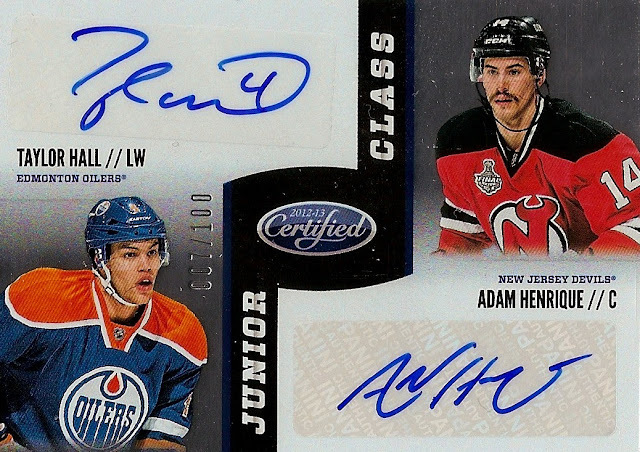 This card is obviously one that would be attractive to many different collectors, not just Oilers and Devils fans but there are many Hall and Henrique collectors that pay big bucks for their sigs. The only downside to the card I can think of is that the AUTO's are stickers, but not a huge deal in the long run. Nice simple design that carries from front to back and the paragraph ties the two Spitfire players together nicely. I really do like the sheer awesomeness of the card, but like I said, I know collectors that would appreciate this much more than I. With that being said, Kyle - we'll be in touch. Also, best wishes to all the hopeful teams in the Stanley Cup play-offs! Hopefully my Nucks can shake the dust off their sticks and get playing the way we use to! Yet another thank you post from yet another awesome guy. I'm a lucky man considering how nice people are toward me and my collection. On to the story. Chris contacted me for help finding some old Canucks/Kings play-off tickets from 2012. He's a Kings fan and is having a little trouble finding Vancouver home tickets. Over the past months I've been searching like a mad man but with little to show for. As I was continually sifting through craigslist and talking to the local collectors, Chris e-mailed me saying he had a nice thank you gift. I have to say, even after all that searching I still don't have the tickets, but he still sent me the card. What a guy eh? Now this card is funky in a lot of ways. First, the design is unorthodox (to say the least), the numbering is a sky scraper high /7,750 but oh boy is this a sick card! 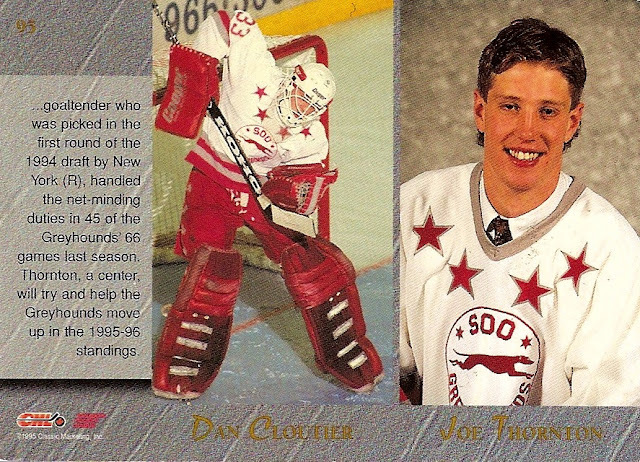 This is my guy Clout in his classic all red pads and bucket helmet from his Greyhound days. This card is cool, cool and more cool! And for a fourth cool, check out the signature. Notice anything different? Probably not if you're not a Cloutier fan. He signed with number 33 not his 39 he wore for most of his career, not that's unique! Thank you Chris; this card will sit nicely next to the rest of my Cloutier hits! Plus its another one off the want list! My Dan Cloutier PC is probably my favourite project at the moment and my friend Kyle from Beware the Hockey Card Closet sent me another card that fits right in. Awhile back Kyle and I figured we had a few cards the other wanted/needed so we did a little swap. I ended up with a Cloutier card I didn't even know existed! 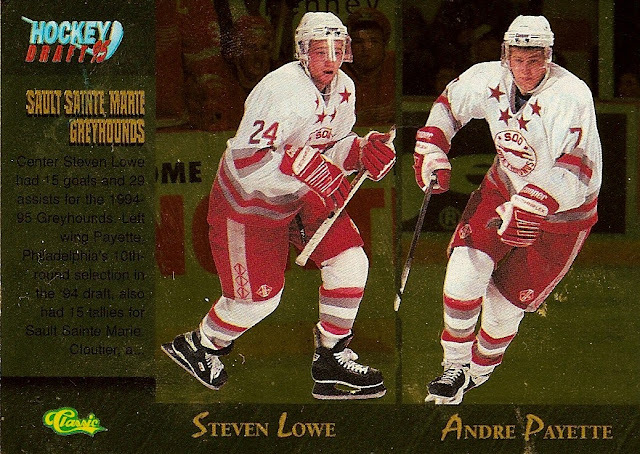 Clout actually shares the card with three other players from the Sault Sainte-Marie Greyhounds of the OHL. The front is covered over with gold foil and has a paragraph along the left that continues onto the back, you don't see that very often. I can't say the design is anything special but the card in whole definitely is. This is a card I had never even seen and it's certainly neat to get my hands on a card this unique. The brand "Classic" must not have had an NHL license because most (if not all) of the cards I own of them are from some sort of junior team. This card was also a special card to Kyle from what he told me. 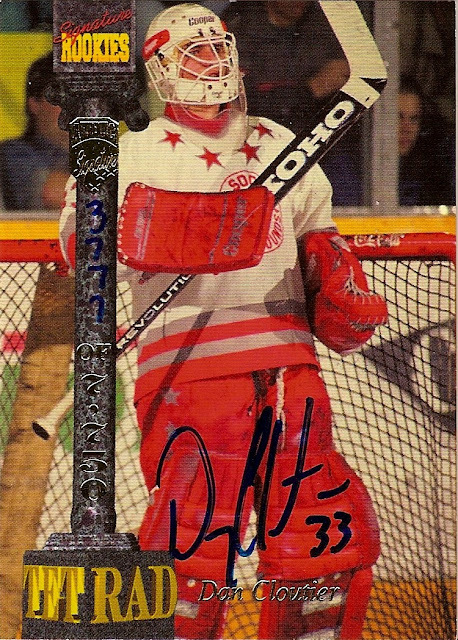 Apparently, this was one of his very first hockey cards. I'm honoured that you let me have it Kyle, thank you! 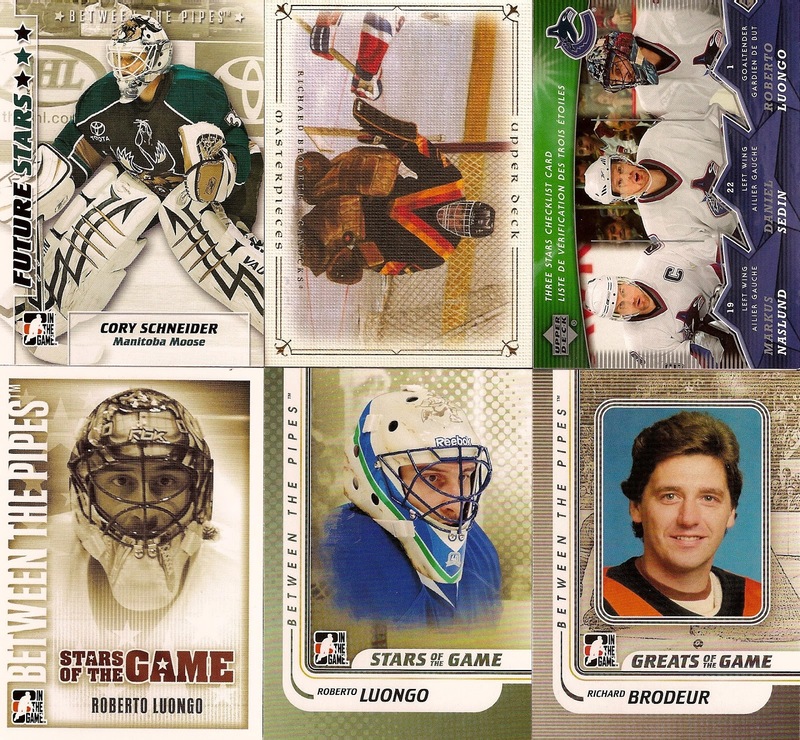 Be sure to check out C4K Cloutier for scans of my entire Cloutier collection. First off, thank you to those who helped me out yesterday with my inner dilemma on what to do with my redemption card to Panini. I have a very interesting update. Today around noon, I came home to an e-mail from Panini saying my redemption had been sent out. Is this a coincidence? I think not, it's the power of the Internet. So now that the card is on it's way, I can't wait to see what it looks like. From the sounds of it, it looks like I have some trading to do! I really am impressed with Panini, although it took a little "push," Panini delivered. Thanks guys. Unanswered Redemption - What To Do? Let me set the scene. November 13th, 2012. I'm opening a few packs of Panini Certified and BAM! Redemption card. My first redemption card ever to be precise. Not a bad one either. 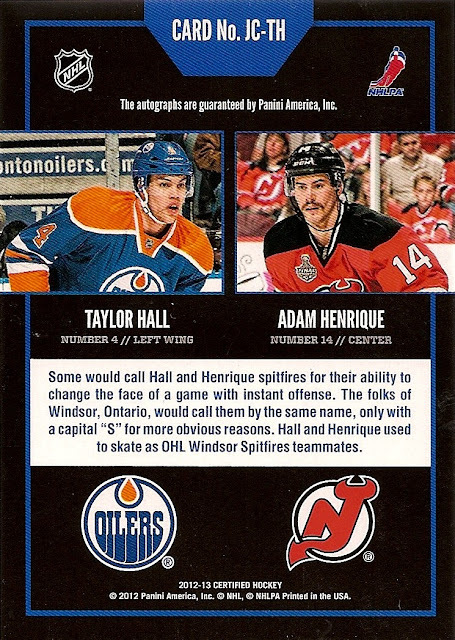 In fact, the card I pulled was numbered to just 100 copies and was a dual signature card of Taylor Hall and Adam Henrique. Although I see myself either trading or selling this card, it's still a significant card to have no doubt. Why do I bring this up? Well 5 months later I still have received no update and I'm sure no progress has been made in making/sending me the card. Now like I mentioned, this is my first time dealing with a redemption; therefore, I'm kinda left in the dark here. I do commend Panini's customer service as I have communicated with them in the past. Tracy Hackler over at Panini's official blog is a generous and understanding guy from what I gather with my past encounters with him. Now I believe I remember selecting the 4 month option for the redemption so they're already a month behind. But, better late than never Panini! So I ask you, my readers: will I ever see THIS card? Will I be able to get my hands on a replacement card? If so, how and when? And lastly, am I pressing the panic button too early? Your help would be much appreciated, chances are you know better than me! First, some housekeeping...I'M BACK! That long 6 week void was by far the longest I've been away from my blog and the blogging world in general. But this is my senior year, so cut me some slack. Between keeping my head above water at school and work, I did sneak in a 12 day road trip with my family. It was one of those scenic trips with even more beautiful "A-ha" moments. But none of that relates to hockey cards, that's what this blogs about right? 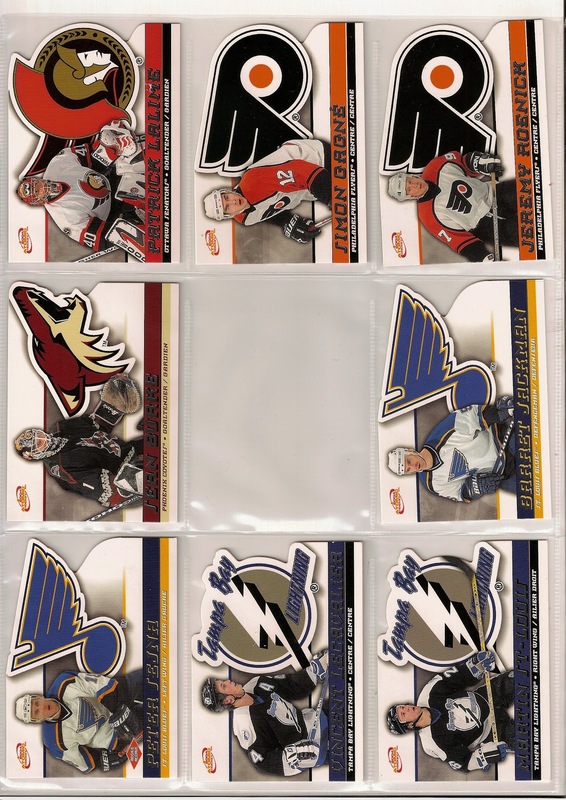 Hockey cards. In my last post, featuring the generosity of Paul D in our last trade, I didn't show the bulk of the actual deal - my first ever real attempt at completing a set without buying a complete set on eBay. In case you're unaware, I chose a childhood favourite set - 2003-04 McDonalds Atomic Hockey. You can see why specifically I chose this set here; but, it basically comes down to nostalgia. In the deal with Paul D, I was able to add 40 cards in addition to my 14. That means I'm missing one card from the base set - #41. In case you have that card, it's of Mario Lemieux. 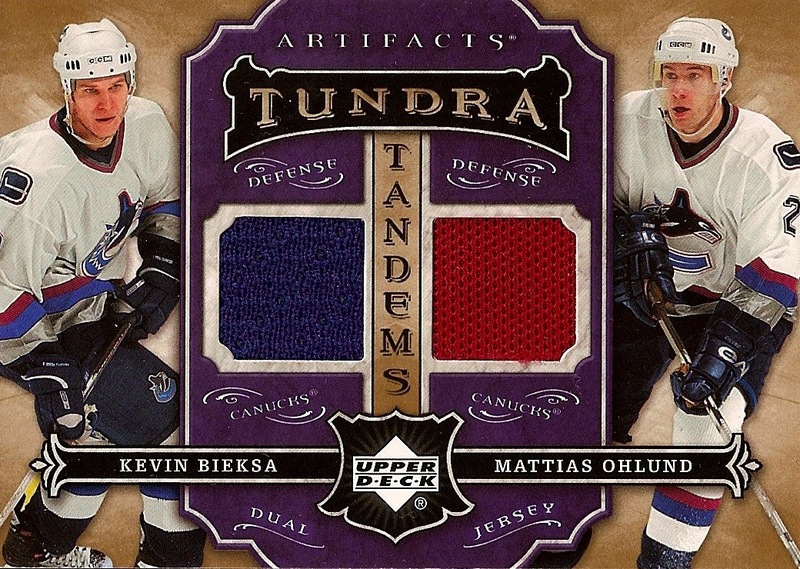 This one...it's missing just one card, that'll bother me until I track down that Lemieux. Just for kicks, here's the backs. Ugh...I spot a Messier. As for the checklists, I now own all of them. They're kinda neat since they show the NHL star as a kid playing hockey. Other than that, nothing scan worthy. I have to give a huge thanks to Paul D for helping me complete the set and for being such a great trader! This is my second trade I made recently, this time with a different Paul. 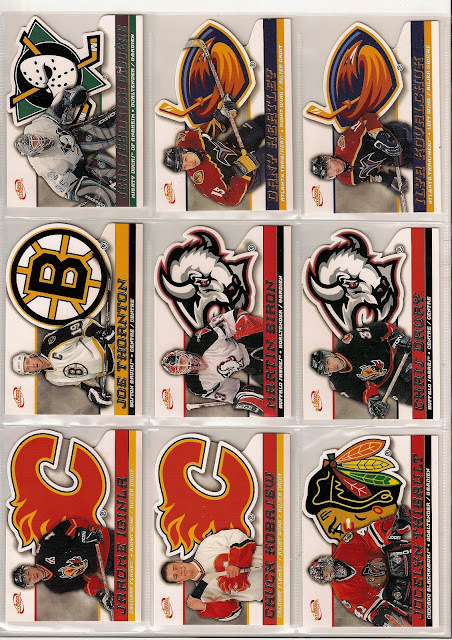 The initial trade was one that included almost my entire needed want list for the 2003-04 McDonalds set. But yet again, there was an overwhelming amount of generosity that came along with it. I was absolutely floored when I saw what he included for me, so much thanks goes to Paul D! First off we have some beauty goalie cards to add to my Goalie Project, which I actually have been neglecting lately and don't know why. This is a good reminder for sure. 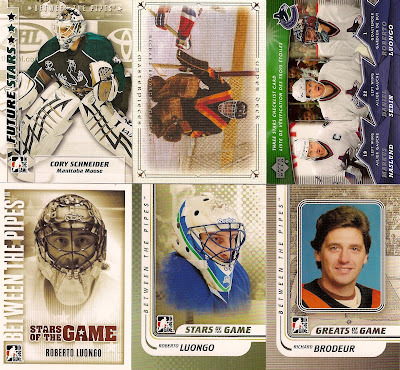 My favourite is definitely that UD Masterpiece of Richard Brodeur, I have one copy already but geez it doesn't hurt to have two of that beauty! Some really nice base cards here and even a nice 90's insert of Pavel Bure thrown in! It's one of those reflective "action" cards really retro and super cool. Probably my favourite base is that of Andre Boudrias, it's a really nice looking retro set and the back of the card is one of my favourites from ITG. Simple but classic. 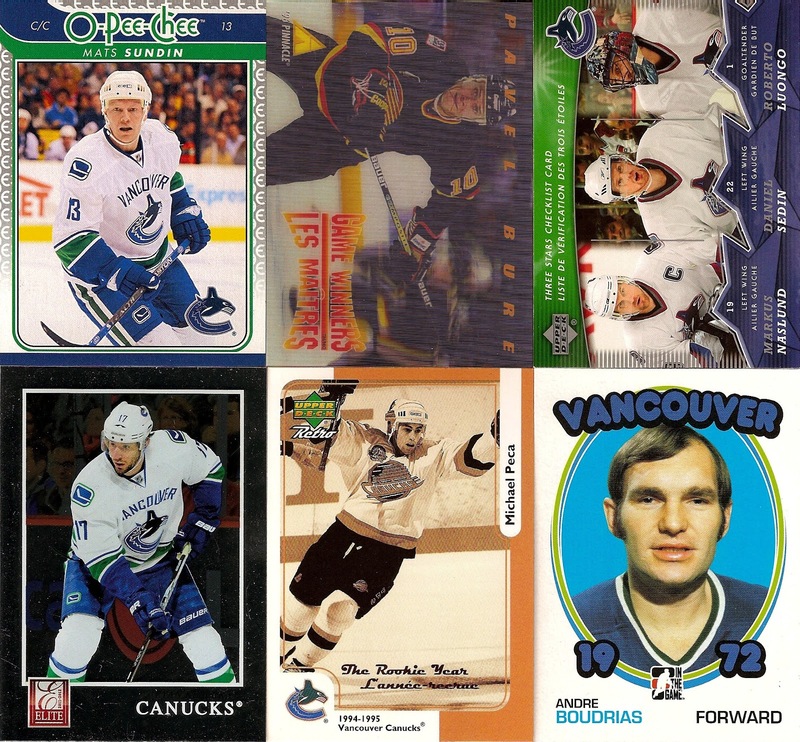 As if that wasn't enough, Paul threw in not one but TWO GU Canucks cards! Canucks captain? Check! 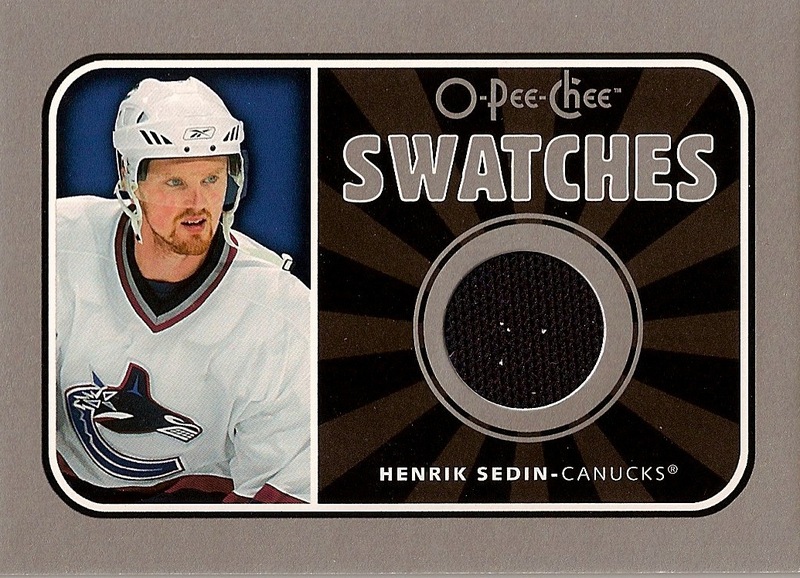 Nice dark colour from the old Canucks jerseys. Weird to say those are "old" considering that's how I remember my Nucks as a kid. A dual GU card from two great Canucks d-men. I don't have a GU piece from either of these guys and especially considering Bieksa is a fan favourite here in Vancity, it's a very nice card. Ohlund was a great vet Canuck that we lost to Tampa Bay seasons ago. But I really liked Mattius, he was solid as ever. Considering we lost Salo to the Lightning in the off-season, TB must really like veteran Nucks d-men. Thanks so much Paul D, the kindness has not gone unnoticed that's for sure!